Building on the success of last spring’s Unified Sports basketball program, Walsh Intramural Sports hosted a Unified Sports Fall Fun Day on Saturday, November 3. 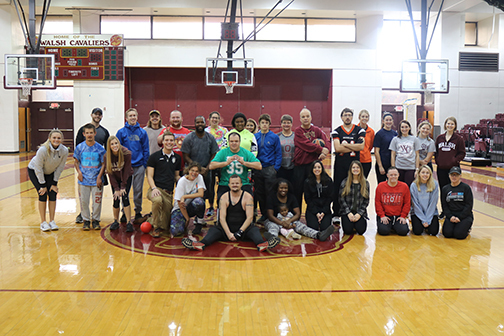 More than 40 registered Walsh students and Unified Sports/Stark County Special Olympic athletes joined together to participate in various games including dodgeball, basketball corn-hole, Frisbee and ladder golf games before enjoying lunch together in the Cecchini Center. Special Olympics athletes competed alongside Walsh students representing various campus clubs and organizations. In Unified Sports, teams are made up of people of similar age and ability. The program was created with the mission to promote social inclusion through sports training and competition experiences. 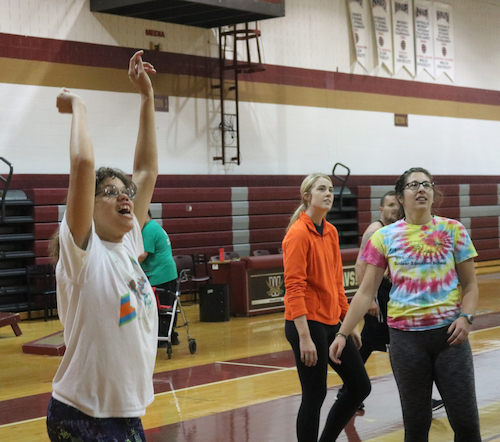 Last March, Walsh University launched Stark County’s first Unified Sports Program that paired Walsh students with Special Olympic athletes for intramural basketball. Created in collaboration from Special Olympics Ohio and Stark County DD, the teams included Walsh students as well as Special Olympic athletes from the Stark County Board of Developmental Disabilities. Unified Sports is an integral part of Special Olympics Unified Champion Schools, which was founded in 2008 and funded through the U.S. Office of Special Education Programs at the U.S. Department of Education to use Special Olympics as a way to build inclusion and tolerance in schools. Unified Sports are now in more than 4,500 elementary, middle and high schools in the United States. Also, 215 U.S. colleges and universities have Special Olympics College Clubs on campus, providing ongoing Unified and inclusionary activities for students and Special Olympics athletes. For more information, visit www.playunified.org. Event coordinators are planning a Unified Basketball Program for February and March, where Unified athletes team up with Walsh students for weekly games. Plans are also underway for a possible Spring Flag Football program.